News > 2016 > Ann Langley saluted in Finland! Ann Langley saluted in Finland! Full Professor Ann Langley (Management) was awarded today an Honorary Doctorate by the Aalto University School of Business. Ten eminen figures in the fields of economics, business administration, science and society, including Finland’s President, were honoured this year by the university located in Helsinki. This distinction is a way for the Aalto University School of Business to recognize the valuable collaboration between Professor Langley and its researchers. 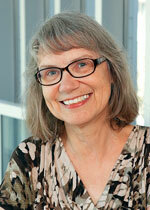 Ms. Langley joined the HEC Montréal faculty in 2000, and directed the MSc and PhD programs from 2003 to 2006. She was appointed holder of the Canada Research Chair in Strategic Management in Pluralistic Settings at HEC Montréal in 2008. She also co-directs the School’s Strategy as Practice Study Group. Professor Langley’s expertise is recognized internationally. She has been a guest professor in Sweden, Norway, the United Kingdom, France, Switzerland, Brazil and Colombia. In 2007, she tied for the Medal for Teaching Excellence awarded by the Conférence internationale des dirigeants des institutions d'enseignement supérieur et de recherche de gestion d'expression française (CIDEGEF). She was inducted into the Royal Society of Canada in 2010. She holds a Master’s in Operational Research from the University of Lancaster, in the UK, and a PhD in Administration from HEC Montréal, and in 2011 received an honorary doctorate from the Norwegian School of Economics and Business Administration. In 2014, HEC Montréal gave her the Pierre Laurin Award, the School’s top prize for excellence in research. Professor Langley specializes in strategic processes and practices, organizational management in the health field, decision making and innovation. For more information on her research interests, see http://youtu.be/9GelQFceJOM.